Hardly a short, simply-worded statement could so sharply describe the ignored human drama of millions of victims of man-made wars, violence, poverty and disasters like the one spelled out by the authoritative voice of Prof. Dr. Konrad Osterwalder, the former rector of United Nations University, a global think tank and postgraduate teaching organisation headquartered in Japan. But while widespread violence and climate catastrophes are common to all continents and countries, there is an overwhelming consensus among experts, scientific community and international specialised organisations that Africa is the most impacted region by them. Only second to Asia, both extension and population wise, Africa is on the one hand home to nearly half of some 40 on-going armed conflicts. On the other, this continent made of 54 states and 1,2 billion inhabitants, is the most hit region by all sorts of consequences of growing climate change—to which by the way it is the least originator. 1. – Droughts combined with population growth, a lack of sustainable land and water management, natural disasters, political conflicts and tensions and other factors have resulted in massive population movements across Africa, the United Nations Environment Programme (UNEP) reports. Displacement in Africa is the result of a multitude of causes including struggles for political power, communal violence, disputes over land, floods, storms and other such natural hazards, it adds. More than half of the world’s fragile states are in sub-Saharan Africa, and some of these states have the largest numbers of internally displaced persons (IDPs). In short, “the relationship between displacement and the environment is well established in Africa. 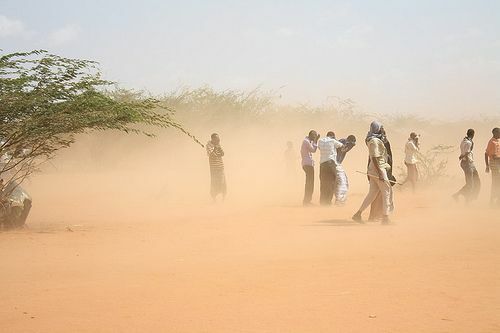 People leave places with slow-onset environmental degradation, such as drought and desertification and continue to flee rapid on-set environmental emergencies such as tropical storms and flash floods,” says Saidou Hamani, Regional Coordinator for Disasters and Conflict sub-programme, UNEP Regional Office for Africa. 2. – According to the 2016 Global Report on Internal Displacement, there were 27.8 million new displacements in 127 countries during 2015, roughly the equivalent of the populations of New York City, London, Paris and Cairo combined; of the total, 8.6 million were associated with conflicts and violence in 28 countries, while 19.2 million were associated with disasters in 113 countries. 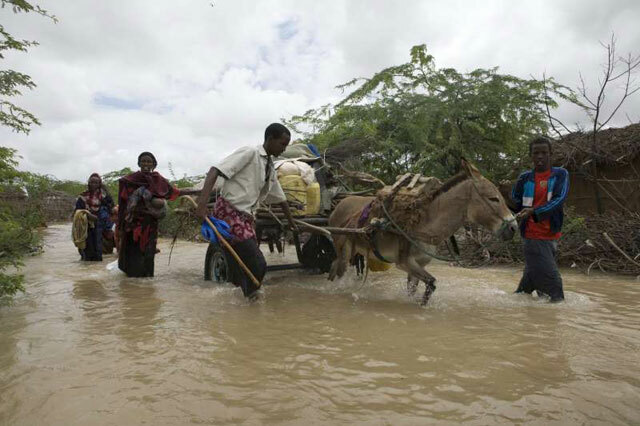 The growing intensity of meteorological disasters due to climate change, coupled with the effects of environmental degradation is likely to continue being a factor behind human displacement. — The International Organization of Migration (IOM) predicts there will be 200 million environmentally-displaced people by the year 2050 with major effects on countries of origin, transit countries, as well as receiving countries. In Africa, environmental degradation and food insecurity are related to floods and other factors such as diminishing pasture for cattle as well as water, firewood and other natural resource scarcities, says IOM. Such factors contribute to displacement, resulting in increasing competition for scarce resources, which also contributes to armed conflict, particularly between pastoralists and sedentary communities. This is especially pronounced in the Sahel (Lake Chad Basin), Sudan, South Sudan, Djibouti, Somalia, Ethiopia and Kenya, all of which have large pastoralist populations who migrate according to seasonal patterns and climatic variations. 3. – “Changes in the regional climate are impacting issues linked to the availability of natural resources essential to livelihoods in the region, as well as food insecurity. 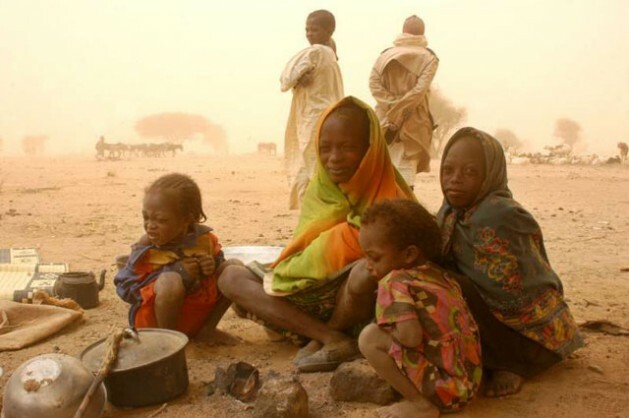 Along with important social, economic and political factors, this can lead to migration, conflict or a combination of the two,” according to Livelihood Security Climate Change, Migration and Conflict in the Sahel. 4. – It is evident that gradual and sudden environmental changes are already resulting in substantial population movements, the UN Refugee agency (UNHCR) reports. Many of them rely on the environment for survival, particularly during emergencies – for food, shelter, energy, fire and warmth, medicine, agriculture, income-generation activities and more, adds UNHCR. 5. – Gradual changes in the environment tend to have an even greater impact on the movement of people than extreme events. For instance, over the last thirty years, twice as many people have been affected by droughts as by storms (1.6 billion compared with approx. 718m),according to the International Disaster Database. In 2008, 20 million persons have been displaced by extreme weather events, compared to 4.6 million internally displaced by conflict and violence over the same period. 6. – Disasters and climate change are a growing concern. Since 2009, an estimated one person every second has been displaced by a disaster, with an average of 22.5 million people displaced by climate or weather-related events since 2008, according to the International Displacement Monitoring Centre www.internal-displacement.org report. (IDMC 2015). 7. – The Intergovernmental Panel on Climate Change, the UN’s science advisory board, projects an increase in the number of displaced over the course of this century. The majority of the people of concern to UNHCR are concentrated in the most vulnerable areas around the world. Climate change will force people into increasing poverty and displacement, exacerbating the factors that lead to conflict, rendering both the humanitarian needs and responses in such situations even more complex. Now two key related events are scheduled to take place in the coming days: Africa Drought Conference in Windhoek, Namibia, August 15-19, and the World Humanitarian Day, August 19.